Construction Site | Brown Family Build Volunteer Campaign for Habitat for Humanity of Hillsborough County FL, Inc.
Volunteer to build a decent, affordable home with the Brown family. Thank you for your interest in volunteering with Habitat for Humanity of Hillsborough County Florida! Volunteers play a vital role within our organization. Our amazing volunteers are passionate about our mission and selflessly don hammers and hard hats to make the dream of homeownership a reality for those who need a hand up. We are excited for you to join our volunteer family and help us build a stronger Hillsborough County. Let's build - together! A hammer is usually the first tool used in building a home with Habitat Hillsborough. For Margarette Brown, the first tool used was a radio. One Saturday morning in January 2016, Margarette was listening to the Call4Help Show on WTMP, as she had done every Saturday since the show began in early 2015. The show’s hosts, Paul and Lori Rebein and Axel Marrero, had a guest speaker that day from Habitat for Humanity of Hillsborough County, to discuss affordable homeownership opportunities made possible by the organization. Margarette decided to call in, and that phone call was the beginning of her journey to owning a home. Listening, though, to that radio show and that guest speaker, gave Margarette hope and spurred her on to action. She applied for the Habitat Homeownership Program and was approved as a Homeowner Candidate. To Margarette, the mother of two grown children, “Home is what you make it.” Very soon, Margarette will be building the home for which she has waited so long – a place she can call her own. “I look forward to having my family, friends and acquaintances come and visit,” she replied. Margarette wishes to thank those who support the building of her home, both donors and volunteers. Welcome. 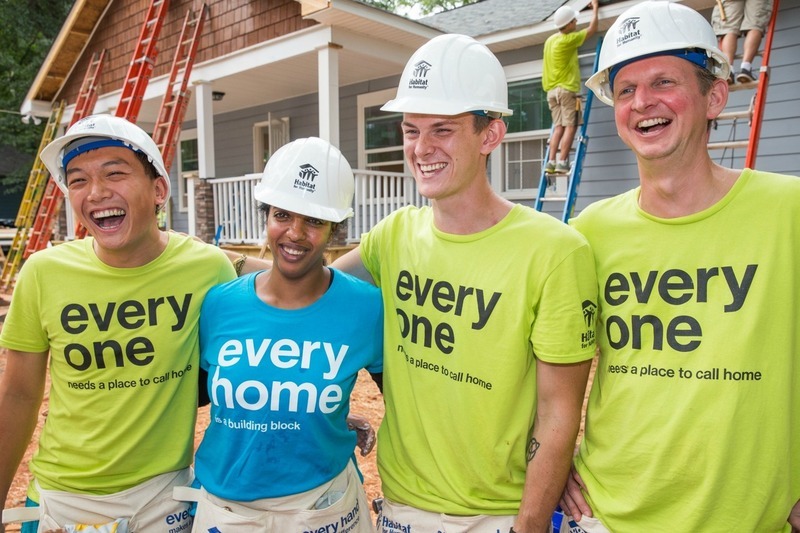 Thank you for volunteering with Habitat for Humanity, believing in our mission, and supporting one important vision - that everyone deserves a decent place to live. Here are some important things to know about your upcoming volunteer day. We build year-round, Tuesday-Saturday from 8 a.m. - 2 p.m.
8:00 a.m. | The work day begins. PLEASE NOTE: Habitat does not provide lunches. Please have each volunteer bring his/her lunch. 2:00 p.m. | The work day ends. Parking: PLEASE carpool, parking is limited on the street. Acceptable attire includes a t-shirt, shorts or jeans, and sneakers or work-boots. Please make sure to wear clothing you don't mind getting dirty and possibly torn or stained. NO flip-flops, Toms, Crocs, or any open toed/back shoes. 1. Water or Coffee | There will be water provided on site, but bringing your own water is always a good idea. It is very important to stay hydrated. Please feel free to bring additional beverages, such as coffee, with you to the work site. 2. Hat and Sunscreen | Most volunteers will be working outside for most of the day (if not the entire day). You will need to protect your neck and face from sunburn. Bring a hat and/or sunscreen. 3. Gloves | Shared work gloves are provided unless you would like to bring your own. 4. A Positive Attitude | Plan on having fun while putting in a hard day's work. Remember the purpose for which you are volunteering - to build a quality home for a hard working family in need! Habitat provides all tools and personal protective equipment. Safety is #1| At Habitat Hillsborough, the safety of volunteers and staff is the highest priority. At the start of the day, the site supervisor will go over our safety rules and answer any questions you may have. Volunteers should immediately report unsafe working conditions and health hazards to the site supervisor. Pay Attention | The best way to ensure safety for all workers is the be aware of your surroundings, at all times. You need to look out for your fellow volunteers like they are looking our for you. If you see a potentially dangerous situation, let the Site Supervisor or someone aware immediately. It's also important to pay attention to the safety talk given at the beginning of your work day. Protect Yourself | It is for your safety to wear any safety equipment provided to your by Habitat. This will depend on the scope of work for the day. In most cases, you will need to wear eye protection and gloves. If you are framing a new home, you will be required to wear a hard hat. If dust bothers you, please wear a dust mask. If working outside, remember to protect yourself from the sun. Follow the Site Supervisor | On each job site, the Site Supervisor is the boss. There may be other ways to perform a specific task, but we do things the Habitat way. Once the Site Supervisor makes a decision, please follow his/her directions.